When it comes to picking the RIGHT sized painting, picture, relief sculpture, mirror, etc. 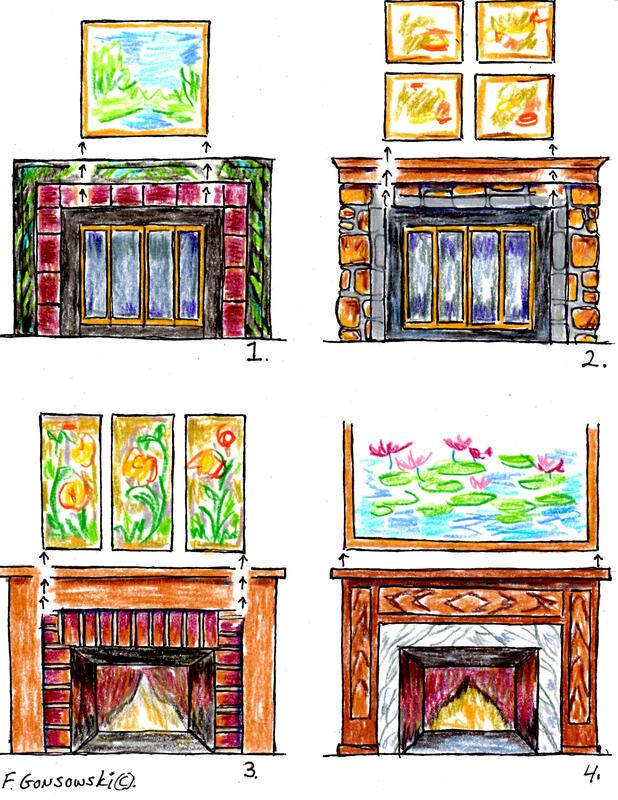 for over your fireplace there are four possible width options for you to choose. Those options relate to the Natural Lines in an Environment. Natural lines in an environment direct your eye from one place to another, hopefully in one smooth movement. Natural lines run both horizontally and vertically in an environment. In the case of the fireplace, they are vertical lines. Lines that direct your eye upward. Illustration 1 shows your first option. Here the natural vertical lines are created by the vertical side lines, that run upward along the glass fireplace doors. Notice how the art work hung above the fireplace is the same width as the glass doors. Following the arrows for this illustration, notice how the eye travels upward from the outside edges of the glass doors, to the outside edge of the frame of the art work, in one straight movement. In Illustration 2, your second option, the natural lines are created by the black filler sides of the fireplace doors. This could also be the width of the firebox. Look at the arrows I provided that guide you upwards from the black surround to the outside edge of the four pictures hung over the fireplace. Illustration 3 shows another option. The natural lines, this time are created by the outside edges of the fireplace surround. Your Forth option is shown in Illustration 4. This option is all about lining up your art object(s) with the outside edge of the vertical side supports of your mantel. If you are hanging up a round mirror or painting over a fireplace, line up the width of the round object with one of the four natural lines from your fireplace. So now the choice is yours. Just decide which one on the 4 natural vertical lines, that the fireplace possesses, attracts you. Measure the distance between the two lines, this is the exact width of object you will need to make a pleasing display. Remember you want your eye to move upward in one consecutive movement from the floor to the space above the mantel. This entry was posted in Hanging Pictures and Mirrors / Arranging Knickknacks and Collectables, Interior Decorating Principles, San Francisco Chronicle / eHow references or resources. Bookmark the permalink. I just discovered you, and I’m so very thankful! I’m going to use your tips to choose a mirror to hang above the fireplace mantle in my living room. For the 16 years we’ve lived in this house, the living room has been “off” to me. I’ve never quite figured out what it was until I read your advice about the balance between the fireplace and above the mantle. This fireplace is on a wall that goes from one story to two stories (in other words, it angles upward). I’ve always struggled with the change in height and how to create balance. In the past month I’ve purchased (and returned!) 4 mirrors to hang above the mantle, all were wrong to my eye. Now I know why! I feel much more confident choosing a mirror now that I’ve read your tips and seen the drawings, which are very helpful. But any advice you could offer would be most appreciated. Thank you so much for sharing your knowledge with us. I want to create a sense of balance and welcome in my home, and you have given me the tips I needed but didn’t know I needed! You are wonderful, thank you again. P.s. I also read your tips about table lamps in a room — super helpful! Hi there Patty, Interior Decorating is ALL about Equal Balance is one of my posts you should read, It’s Easy to Decorate a Room with a Tall/High Ceiling is another. There will be Companion Posts following those article and other articles that will cover topics that might interest your. my fireplace measur 52inches from end to end what is the best size round mirror to hang? Hi there s. cariello, the right size mirror would line up with the firebox, the fireplace surround, or the inside or outside edges of the mantel. If in doubt take news papers, tape them together, cut out a circle for each size that you are considering, tape the news paper template over the fireplace with painters’ tape, and you will see which size of mirror works best for you. Good luck with your project. Thank God for this post. My liVing room has looked so odd for over 10 yrs. I am clueless at decorating. Also sent this to my 20 yr old daughter who just bought a home. Hi there Juanita, glad to have been of help. Did you look at the other picture hanging posts that I wrote, they are in the companion posts at the end of the article. This was so helpful! We just moved into a house with a fireplace and I’m almost giddy thinking of how to decorate around it 🙂 Is it a faux pas to have a mirror AND stuff on the mantle? I’m thinking seasonal displays, garland at Christmas, etc. I am like the rest, the fireplace seems off… I haven tried so many different ideas. How tall should the mantel picture be? Did I miss that part? Hi there Debi, I can’t tell you the right height for a picture over a fireplace, because mantles and ceiling heights differ. I would say find a picture you like that works with the widths that I’ve gone over. Then get the measurements for both its “height” and width. Go home, tape newspapers together to represent the exact dimensions of the art piece, and tape that sample template to the wall over the fireplace with painters tape. In a minute you will know if you like the size of what attracts you over your fireplace. Also look at my post titled A Bridge unites Tablescapes and Wall Decor. The same principles work with arranging things on a fireplace mantel. Good luck with your project.